Today we're looking at two small business juggernauts, Zoho and Freshworks. Both provide a suite of core features for every business. Zoho is $310 billion company that has built pretty much every small business product under the sun. Freshworks has a similar kind of platform but with objectively better design and UI. Both companies are even down the road from one another in Chennai, India. In this week's teardown, Peter and I take a look at the data and dig into how these two companies are clashed in a battle by offering a strikingly similar platform. Can Zoho win out over Freshworks' slick design and premium pricing, or will Freshworks' newer feel get them the victory? Let's find out. Both companies sport a number of different products that help small business owners go about their day-to-day tasks. 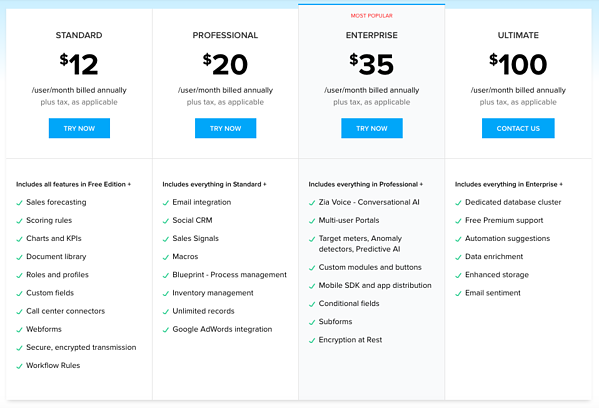 Zoho started out by offering a CRM, and their pricing reflects a pretty standard tier situation. Each package Zoho provides is billed on a per-user per-month basis and differentiates by scaling up more typical enterprise features related to automation, integration, and security. The customer can upgrade to a more robust package as their business grows. At $30 per employee, per month, they also offer a platform called Zoho One, positioned as an all-in-one tool that serves the needs of small business owners. 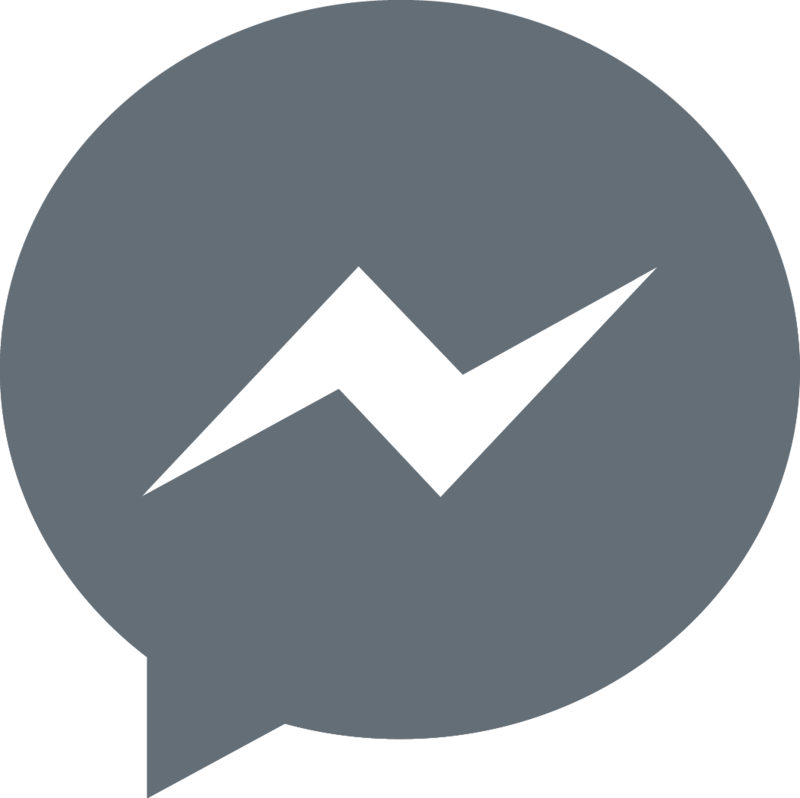 This is really their play to get customers as deep into their service as possible, focusing on a suite of features that can hopefully retain their business for as long as possible. When we take a look at the data from 7,159 current, former, or prospective customers, you can see that the pricing strategy for these two products really does stack up nicely in relation to the overall monthly willingness to pay. 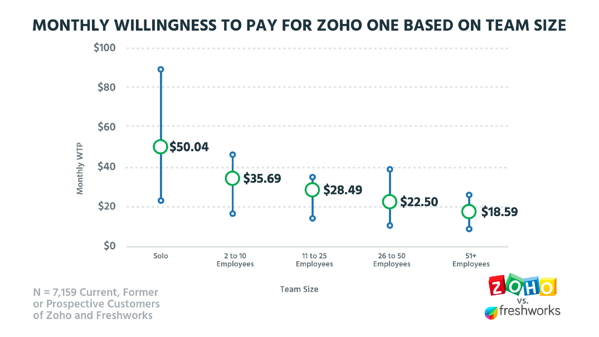 With the 2 to 10, 11 to 25, and 26 to 50 employee tiers being Zoho's real target market, it's not hard to imagine that $30 feels okay for most of those customers. As the customer's business grows beyond 51 employees, Zoho might run into trouble, but the customer will likely be going more towards an enterprise product at that point anyway. Their real missed opportunity is in the solo market, where the average willingness to pay is $50.04 and swings way up to around $90. Zoho should really come out with a more robust solopreneur plan that taps into this available willingness to pay. 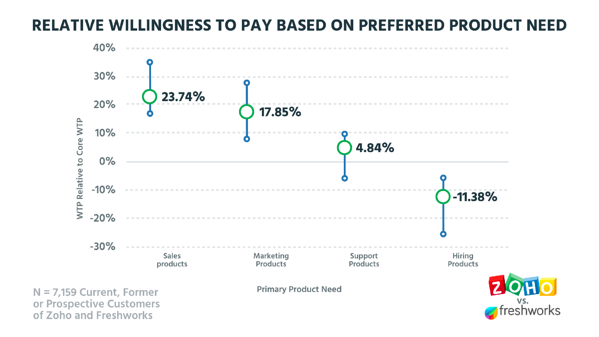 Since Zoho and Freshworks both offer a slew of different products that are geared towards every different area of the market, it's interesting to see what customers are actually willing to pay for in terms of specific types of products. Based on the customers we surveyed you can see that sales and marketing products are really the revenue drivers. That's not at all surprising; they're the aspects of a small business that actually make money, so people are willing to pay for them. Products like support and hiring are way less important, with hiring dropping to negative 11.38%. Small business owners really don't need something like that until their business is more established and growing. “I think about the two most critical elements of our business today, which probably revolves around Hiring and Support. Yet, the two things that got us here were likely Marketing and Sales, which is totally in line with the data.” Peter Zotto, General Manager. If you're offering products that focus on different aspects of the business, it will be important to make sure you're not over- or underpricing them based on the customer's expectation. Your sales- and marketing-based products can see a lift from those related to support and hiring as they're potentially driving more revenue for the customer through their use. The first thing you see when going to Freshworks' website is their design. It's much clearer than Zoho, and they're using design to create a sense that their products give business owners the ability to do their jobs better. 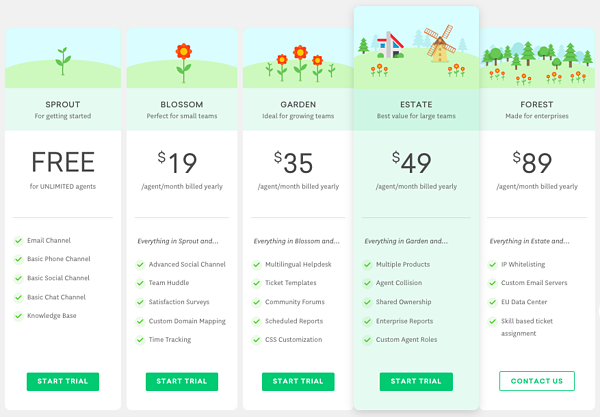 The pricing page specifically is positioned to feel more premium than Zoho, and that's reflected in their pricing. While their tiers are differentiated in much the same way as Zoho, the price points start higher and scale up at a bit more even pace. You still have the same kind of positioning at each tier: small teams, growing teams, larger teams, and enterprise but with an added free tier to get people in the door. This free option gives Freshworks something that Zoho doesn't have and will potentially get more customers due to the lack of friction to start a freemium tier. When we take a look at the data collected on willingness to pay for Freshworks, there's definitely a sense that their product is more premium than Zoho. For each team size, we're seeing a 10% to 25% bump in the willingness to pay for Freshworks over Zoho. The outlier again is the solo level, which sports a huge willingness to pay at $104.60, which is more than double the $50.04 we saw for Zoho. This means that Freshworks is also missing out on the potential revenue coming in from a solopreneur plan. 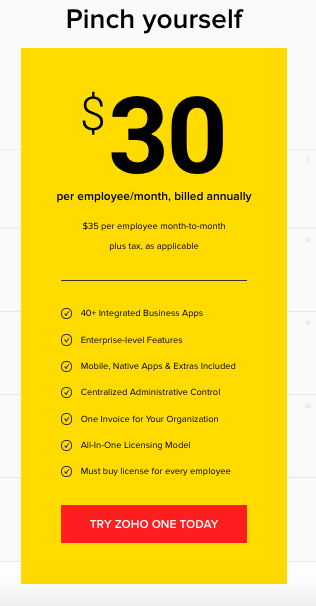 While Freshworks has pricing that more or less aligns with the 2 to 10, 11 to 25, and 26 to 50 levels, they run into the same problems as Zoho and could definitely work to refine their pricing strategy. Both companies could likely raise their prices by $5 to $10 without much backlash from their existing customer base. If we take a look at the relative feature preference for both companies in relation to the willingness to pay, there are some interesting takeaways. From a value proposition standpoint Freshworks is nailing the Core Features much more than Zoho. We know their design is much more modern and sleek than Zoho, but when you take a look at their site, the language and social proof includes quotes about how simple and easy-to-use their product is. While people aren't really willing to pay for these kinds of things, it definitely positions Freshworks to get more customers in the door on page design alone. The Differentiable Features section tells much the same story as the relative willingness to pay based on product-need data. Features like tools that help you sell and tools that help you market are way out in the top right quadrant. These tools are arguably the ones that help make the business money, so customers are more willing to pay for those than tools to help you support or especially tools to help you hire. As small business owners, their priorities are less about growing their team and more about growing their revenue. 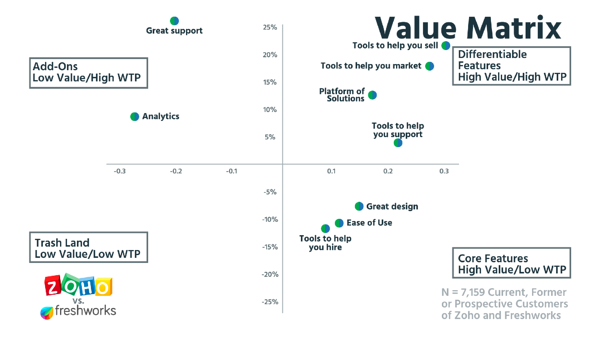 When you take a look at this value matrix, it ties into a trend we're seeing more and more as the SaaS market continues to grow. The relative value of features is going down. People aren't going to tolerate a product that doesn't provide them with a great user experience, even if the tools are amazing. Zoho and Freshworks are at a place where the core software they provide isn't going to be enough to get customers through the door. They need to find a compelling way to speak about their company from a positioning and packaging standpoint that's going to differentiate them from their competitors. This is especially true when you're offering essentially the exact same kind of product in the market. As users, both Peter and I would go for Freshworks. It's kind of a no-brainer for the both of us. Their design and UI are just so much better, and as a core feature that's something that we can't ignore. That said, Peter would go for Zoho as an investor. They've been around for years, made several different key pivots to continue to grow, and still have opportunities to optimize in the future. I'd go with Freshworks purely from a growth perspective. They're poised to continue growing faster and bigger than Zoho, and it just makes sense. What do you think? Now that we've been through this analysis, in terms of future prospects who do you think is better off, Zoho or Freshworks? Tag us @PriceIntelligently or @ProfitWell using #PPT and let us know. 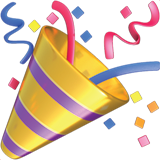 We'll give you a year of service from the service of your choice. Be sure to vote through the video as well!